Italian Tuna and Chickpea Salad. Hummus Tartine with Scallion-Mint Pesto. Salmon Burgers with Pickled Ginger. These are just a few of the scrumptious-sounding recipes included in Gwyneth Paltrow’s new cookbook, It’s All Good. But this food doesn’t just taste good: According to Gwyneth, these sugar, dairy and gluten-free dishes will help to cleanse the body and revive the spirit. And who doesn’t want a little uplift on the daily menu? Gwyneth may be in domestic goddess mode at the moment, but she remains one of Mr. Valentino’s major muses. And they’re more than just friends: As Gwyneth told a reporter in 2004, “I will forever love those men like they're family. They are just extraordinary people.” She even refers to Mr. Valentino and Mr. Giammetti as her “Dads.” When Mr. Giammetti celebrated his birthday with a gala in St. Petersburg, Gwyneth rose to read a poem in his honor. 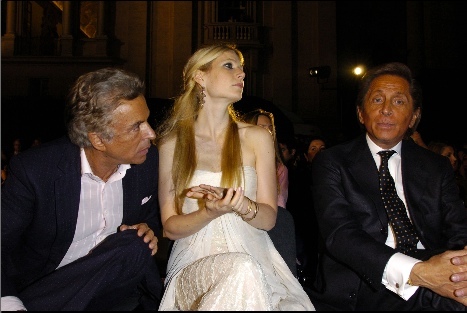 And needless to say, Valentino always looks good on long, lithe, elegant Gwyneth, whether she’s stunning in a hand-beaded black column dress at the Venice Film Festival in 2002, or pulling a demure empire-waist gown from the archives to wear to the event Una notte a Roma con” in June, 2005.